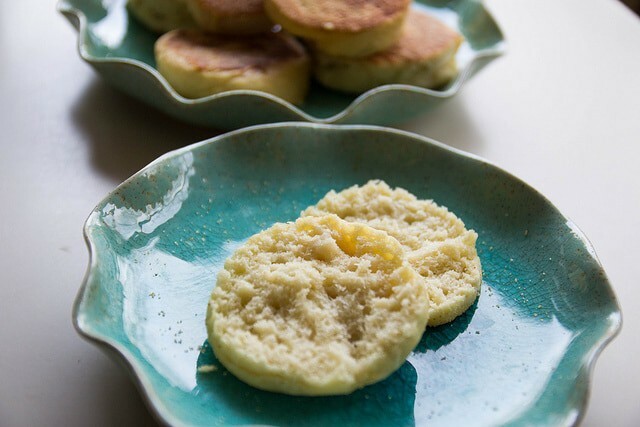 Are you looking for an English muffin recipe with lots of nooks and crannies? 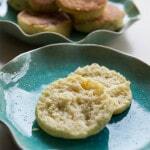 Try these amazing English muffins! Easy to make too! After mixing the batter, you will let it sit covered for 30 minutes and then you are ready to put them on the griddle. I’d been interested in making English muffins for a while now, and just never got around to it. Many of the recipes that I saw did not show crumb shots (ie, the inside of the muffin) and those that did showed a bread-like interior that wasn’t what I was hoping to duplicate. I knew that the dough I was shooting for would have to be very very wet to get those holes inside, and so my attention shifted towards Alton Brown’s recipe. The only downside is that you’ll need 3-inch English muffin rings (or egg rings) (you can make them free-form but they will be oddly shaped). I used egg rings and only had 3 on hand so it was a bit of a pain because I had to make them 3 times. 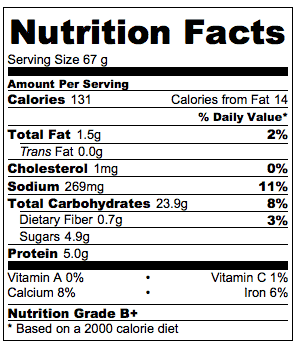 But, all worth it and so good that I just ordered English muffin rings for next time. These are great with some jam, or just a pat of butter. I’m also looking forward to making some Eggs Benedict with them…mmmm! By the way, if you want to get the nooks and crannies, make sure that you split them open with a fork, not a knife. Fill each tin with about 1/4 cup of batter, sprinkle tops with more cornmeal, and then cover the tins with a flat try or inverted baking pan.